Get your olive and vegetable oil at Woolworths for half price this week. Bertolli Extra Virgin olive oil of 750mL bottle will cost only $6.50 which is a half price. A rich variety in your pantry will make you feel comfortable when you want to cook something. It may be an unnecessary waste of time to go shopping every time you want to make a delicious meal. Stock up your pantry products so that you will have the ingredients in your inventory whenever you need them. Shop for the half prices by Woolies. Visit pg 10-11 for noodles, sauce, pasta, and more are available. Liddells lactose-free long life milk, Nestle Milo, and other breakfast foods are also possible to buy at a lower price. Shop fresh fruits at Woolies this week. Avocado, Royal Gala, seedless, Mushrooms, Yellow Peaches are a source of vitamin and healthy nutrition. Beef mince, Old El Paso spice mix, taco shells are half-price or discount products. Easy meals are the best things in the pantry and meat range of Woolworths. Combo sales are available. Woolworths Hokkien noodles, teriyaki sauces, and meat are in the combo deal. Find bonus tiles participating items of deli department. Salami, leg ham, tasty sticks, kebab varieties are on sale. Hot Cross Buns from the bakery dept. will cost only $3.50 pk at Woolworths. In March-April people go for the Lenten seafood products. In Woolworths, it's not different than other stores but greater deals are available. Find shrimp, prawns, salmon fillet, and more packaged seafood products in the seafood dept. View these items on pg 19-20. There are many ways to withstand the economic struggle of modern days. Most of them might seem ineffective but organising your shopping schedule with the price range adjusted by Woolworths Catalogue sales or similar sort of online browsing systems of products are really useful. People prefer to make their shopping lists using the supermarket catalogues like the Woolworths Catalogue. Snacks are the first important thing to notice in the latest Woolies sale. To get your costs dropped at a very low level, there are alternative ways of savings. For example, win a trip to Disneyland with bonus tiles. Participating items to the bonus tile deal are on pg 3. Colgate advanced whitening, Palmolive, D'Orsogna ham, and more are available with the bonus tiles. More is also on the catalogue. Drinks and snacks sale of the Woolworths Catalogue covers popular chips, Smith's chips, Arnott's, and Pringles are viewable on pg 4-5. Celebrate Easter with Easter bunny from Cadbury, Lindt, and more brands at Coles supermarket. This week, you have them on pg 6&7. 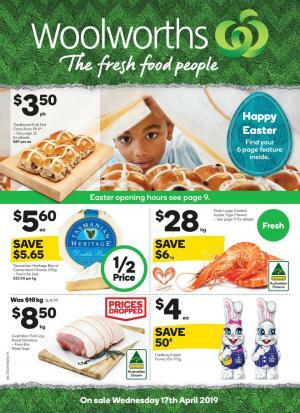 Shop prices dropped deals of Powerade, Coca-Cola, Cadbury Adult sitting bunny, Cadbury crate in the Easter part of the Woolies in this catalogue. Try the new flavour of Lindt bars, nocciolatte, and more snacks for breakfast. 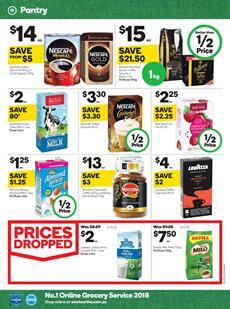 LeSnak, Vegemite, Nutella Hazelnut spread, Capilano honey pail, and coffee variety is available on pg 8-9. Shop the best prices of the Woolies and celebrate Easter. A part of the Woolworths Catalogue grocery sale is about quick meals and the other showcases the food to make your own dinner. Vegetables, pantry products, rice, pasta, and more are available in the grocery and pantry shelves of Woolworths. Everything is on sale on the catalogue. Moreover, you will also see gluten-free foods such as dairy-free chocolate cheesecake, apple pie, gluten chocolate cake, Anzac biscuits, and more. Check out the half-price deals on Barilla pasta sauce, Uncle Ben's microwaveable rice, and more items on pg 13. Visit the fresh produce section of the catalogue for red grapes, raspberries, nectarines, and brushed potatoes. Roasted & Salted pistachios of a 400g pack are only $8! Prices dropped this week for pre-packed salad varieties, classic meals, beef bolar blade roast, beef lasagne on pg 16-17. This is the part where you can cook amazing meals for dinner or lunch. Also, great seafood offers are waiting for all customers on the catalogue. Check out bag & bake sale offering Aussie tiger prawns, thawed large green Aussie banana prawns, and more. Buy Anzac biscuits for half price at Woolies. Hot Cross Bun varieties, and variety of the buns are also available in the bakery sale on pg 19. Seafood for Lent is an interesting part of the catalogue. Packaged seafood range is an alternative food for everyone who wants to join the religious activities in March and April. The price of Streets Paddle pop is $2 cheaper this week. Get Sara Lee ice cream of 1L tub for $6 to save $3. Superfries of McCain and Ingham's frozen chicken breast tenders are in the "prices dropped" category. A chance of winning a trip to Disneyland in California will be a thing in Woolworths stores this week. You can win 1 of 10 trips with the bonus tiles. Spend $30 on bonus tiles products. Each trip has a $30.000 value. You can shop a lot of products at half prices. Old El Paso, Peters Drumsticks, and many more items are half-price deals. For example, Tresemme shampoo or conditioner, Olay Regenerist whip face moisturizer, Chobani yogurt pots are bonus tiles items. Some of them are half-price deals. Check out the snacks and drinks range on pg 4-5. The Natural Confectionery Co., Poppin popcorn, and chocolate bars like Lindt Excellence that has 70% cocoa in it, are available on pg 4. Buy Schweppes Lemonade 24x375mL pack for only $13.40! A new flavor of Pringles and new product of Nobby's loaded nuts are two things to discover in this part of the catalogue. There is also a Doritos cracker with a new flavour at half price on pg 4. Special sales and highlights are guides to more savings and nice new products. See two of them on pg 6. Flipz Chocolate coated pretzels and Monster Energy drink are great offers. Try Monster pipeline punch energy juice for only $2.75 saving $.85! A fine and nutritional breakfast can be a great source of an early working day energy boost. What you need is available for a good breakfast at Woolies. Kellogg's nutri-grain, Nature Valley Bars, Nice & Natural whole seed protein bars, Carman's cluster, and more are on sale. Again, you can see a number of half-price deals from this sale. Vitasoy soy milk or almond milk or like-class products including coffee are available on pg 8. Explore the products of the health & beauty category of the Woolworths Catalogue. Shop makeup items of Revlon, ecotools, Rimmel London, Maybelline NY, Sally Hansen, lip smacker, and more brands. A separate catalogue of health & beauty products is also available. Get your needs for half-professional tools at lower prices. Woolies also offers a great range of bonus tile products of Nivea. Men's moisturizer, roll-on deo, shower cream, nourishing body lotion, and more products of Nivea are available with bonus tiles on pg 33. Browse more of the health-beauty sale of Woolies. Blackmores glucosamine, probiotics, and more are examples of the products. Feminine care items are possible to find in the regular catalogues. Libra ultra thin pads pk 10-14 will cost only $2.75. That's a deal to save $1.45! Also, see the household & cleaning supplies on pg 35. Dynamo laundry liquid, Air Wick essential oil, Duck deep action toilet gel, Pine O Cleen disinfectant, and Quilton tuffy are half-price deals of this week. Shop these items until 12 Mar for these prices. Super savers will be in your inbox when you subscribe to the newsletter.